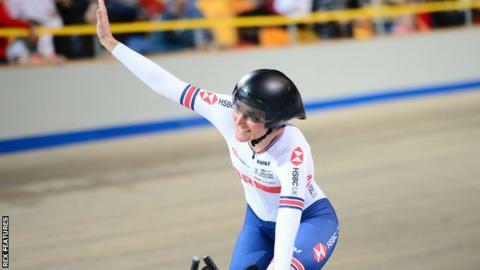 Sophie Thornhill and pilot Helen Scott won the WB 1km time trial before James Ball and Pete Mitchell claimed a surprise gold in the men's event. In the men's MC4 individual pursuit, Britain's George Peasgood claimed a silver medal after being beaten by world and Paralympic champion Jozef Metelka of Slovakia. Toft's win saw her claim her second medal of the week after her victory on the opening day in the WC1 3km pursuit. Toft also won the omnium but as it is a test event at this year's World Championships, no medals were awarded. Storey, 41, also won silver in Friday's 500m time trial. "I can't believe it, we've worked so hard for that. I'm so happy," 27-year-old Ball said.